VICE President Yemi Osinbajo yesterday argued that the struggle to restructure Nigeria started several years ago by people who saw the need early and who were sincere about it. Using restructuring as a major campaign pledge, he said, is out of place for politicians like the Peopleâ€™s Democratic Party (PDP) presidential candidate Abubakar Atiku because he opposed it when he had the opportunity to join in implementing it. 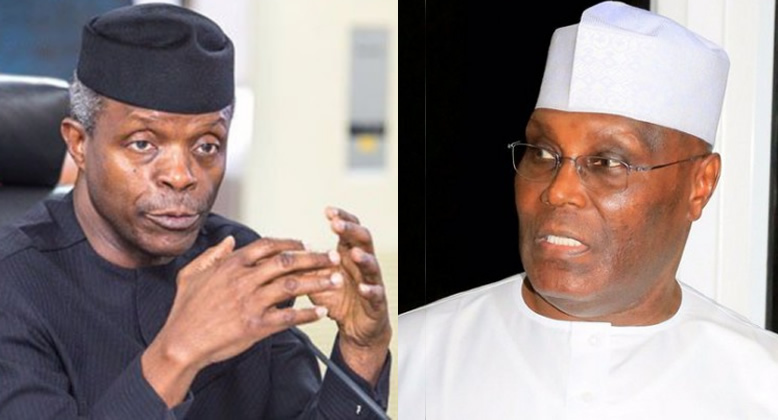 In fact, Osinbajo recalled how Atiku opposed the moves made by the Lagos State Government for the countryâ€™s restructuring when the PDP candidate was the vice president under Olusegun Obasanjoâ€™s administration. Osinbajo, who chaired Akandeâ€™s 80th birthday colloquium in Ibadan, the Oyo State capital, recalled that the then Lagos State Government under the leadership of Asiwaju Bola Tinubu made presentation to the Federal Government for Nigeriaâ€™s restructuring, particularly the practice of true and fiscal federalism, but that Atiku, who was then vice president, rejected the move. Osinbajo was addressing the topic of the colloquium, â€œNigeria: Achieving national unity through peaceful restructuringâ€. He served as Lagos State Commissioner for Justice at the time. The vice president noted that Tinubu told him straight away when he was invited to be part of his administration that his major aim was to pursue restructuring and devolution of power to the states through legal and political means for the countryâ€™s betterment. He said Atikuâ€™s rejection forced Lagos State to look inward and undertake the struggle alone, a move, which he said, paid off eventually. According to the VP, Lagos State pursued it through the courts, adding that it succeeded in winning on four major issues. They are: the power of the states to create local governments, the declaration that the Federal Government does not have the right to withhold federal allocation of any state or local government being jointly owned by the federating units, the right of states to create taxes and the right to issue their own urban and regional plan to which the Federal Government must comply, if it has any property in the state. The vice president emphasised that there was a general agreement among Nigerians on the need for restructuring, but that the structure it must take was what citizens from different divides were yet to agree on. In his presentation, Kaduna State Governor Nasir el-Rufai, who gave the keynote speech, said in spite of the fact that some Nigerian elite were trivialising the issue, â€œit is a serious matter for Nigeria because it is needed for the country to move faster on the growth laneâ€. He warned Nigerians to be mindful of those using restructuring to deceive. The governor said his position on the need for restructuring had been well-known before he became governor as he never hid his view. El-Rufai posited that restructuring must be about the reform of the country to make it fit for efficiency. He explained that the All Progressives Congress (APC) set up a committee to work on the issue last year as a way of giving structure to what was popularly desired and which the party believes in. He served as the chairman of the committee. He hailed the regional government run in the First Republic and noted that Federalism degenerated through military intervention from 1966. He said concentration of power at the centre weakens Federalism. El-Rufai emphasised that northern Nigeria was ready for inclusive restructuring â€œsince it will benefit allâ€. The governor posited that the Federal Government should shed its weight in healthcare delivery, infrastructures and commerce, among others, stressing that it cannot do well in them like states and local governments. El-Rufai revealed that the committee recommended that the Federal Government should shed its load on police, railway, fingerprint identity and handover onshore oil to states for efficiency. The governor posited that a uniform constitution for the structure and administrative management for the 774 local governments was anti-efficiency. He believes that while the constitution should provide the legal framework, the structure of each local government should be determined by the state, according to its uniqueness. He also added that the states should be allowed to fix allocation for each local government as they have a better understanding of their uniqueness. El-Rufai condemned the sharing formula used for federal allocation, saying the Federal Government should receive less than the 52 per cent it presently receives to enable states have increased allocation. On this, he paused to pay tributes to Tinubu for the feat he achieved in raising the Internally Generated Revenue (IGR) of Lagos State. In summary, he said the committee recommended devolution of power to states, adding that only the states and Federal Government should be recognised as the federating units. One of the discussants, Prof. Adigun Agbaje, said restructuring is an ongoing discussion as the country makes efforts to overcome its challenges. He, however, believes that it is possible to have three federating units. Another discussant, Senator Olu Adetunmbi, believes that the issue has attracted emotion, religious and ethnic sentiment because the elite have failed to approach it from the economic perspective. He said if ordinary Nigerians and major stakeholders understand that restructuring would engender creation of more jobs, lighten bureaucracy and empower states and local governments the more, they would embrace it with more zeal. Former Senate President Ken Nnamani said it was still possible for Nigeria to restructure without violence or disintegration. He, however, stressed that the government must collaborate with the National Assembly for it to be smooth and successful. Oyo State Governor Abiola Ajimobi said the choice of the theme underscored the fact that Chief Akande remains one of the most authentic apostles of the late sage, Chief Obafemi Awolowo, alive today. ENCOMIUMS poured in from dignitaries for an elder statesman and former governor of Osun State, Chief Bisi Akande, at his 80th birthday colloquium in Ibadan, the Oyo State capital, yesterday. Akande, who was the Interim National Chairman of the All Progressives Congress (APC), played host to who-is-who in the party in the Southwest, with some of its leading lights in the North and a former Senate President, Ken Nnamani in attendance. Congratulating Akande on joining octogenarians, Osinbajo described the politician as a forthright and modest leader, who is trusted . He said his modest lifestyle should be emulated by all. Oyo State Governor Abiola Ajimobi described Akande in superlative words, saying he is selfless and incorruptible. To him, Akande qualifies to be named the Nigerianâ€™s politician of the Century. His words: â€œHe undisputedly qualifies to be named Nigeriaâ€™s Politician of the Century, judging by his role and continued personal sacrifices in ensuring the preservation of progressive democratic tenets. He is and should rightly be referred to as the very last of the Old Brigades who have remained unbending and unbowed in democratic governance ideals. He noted that the birthday ceremony showed that Nigerians appreciate his contributions to national growth, stressing that Akande had always been in progressive politics. Dr. Usman Bugaje described Akande as a source of inspiration. In a colourfully decorated hall, Chief Akande, who decked a sparkling white agbada and a cap to match, was beaming as he received guests and acknowledged cheers from well-wishers. At the event also were Governors Ibikunle Amosu (Ogun State); Oluwarotimi Akeredolu (Ondo State); Kayode Fayemi (Ekiti State) and Akinwumi Ambode (Lagos State), who was represented by his deputy, Mrs Idiat Adebule. They were joined by the partyâ€™s National Leader, Asiwaju Bola Tinubu. The programme kicked off with an opening prayer by the Catholic Archbishop of Ibadan Archdiocese, Leke Abegunrin. Popular poet and oriki exponent Ajobiewe thrilled the audience with drummers complementing his rendition. Other dignitaries at the event include former Osun State Governor Rauf Aregbesola and his wife Serifat; former Ogun State Governor Segun Osoba; Osun State Deputy Governor Gboyega Alabi; former Senate President Ken Nnamani and members of the National Assembly. Others include Minister of Health Prof. Isaac Adewole; Minister of Information and Culture Lai Mohammed; Speaker of the Oyo State House of Assembly, and a former deputy governor of Oyo State, Chief Iyiola Oladokun. Others are Lt-Gen. Alani Akinrinade (retd); Hon. Wale Oshun; one-time Lagos State Finance Commissioner Mr. Wale Edun; Prof. Olu Aina; Chief Adegboyega Awomoolo (SAN); Chief Dosu Oladipo; Chief Paul Akinyelure; Sen. Biyi Durojaye; the Group Managing Director, Oduâ€™a Investments Ltd. Mr. Adewale Raji; Osun State APC Chairman Chief Gboyega Famoodun, Mr. Ayo Afolabi and the Orangun of Oke-Ila, Oba Adedokun Abolarin.